In the ancient time, Xi’an did not suffer from water shortages, as it does nowadays. There was more than enough water running down the nearby Qinling Mountains to feed many rivers that flow past the city to form the ancient beauty of “Eight Rivers Surrounding the Capital.” However, over the years, the combined effects of climate change, hydrogeological variability, rapid industrialization and urbanization, over-utilization and improper management of the water resources resulted in the deterioration of the ancient “water beauty,” to a great extent. Consequently, water environmental quality deterioration became a major hindrance to the sustainable development of the city. Therefore, the Xi’an Municipal Government developed priorities to implement innovative solutions based on integrated urban water planning and management. The so-called “Eight Rivers Regeneration” project is a major investment to restore sustainable water management to the city. The project includes the construction of 5 water supply lines, restoration of 7 wetlands, rehabilitation of 10 river channels, and reconstruction of 28 lakes, including a number of waterfront parks designed to imitate Tang Dynasty landscapes known from ancient illustrations. The construction work for this project follows an integrated plan that uses diverse sources of water – natural precipitation, streams, and reclaimed water to create a quasi-natural urban water cycle that provides both reliable water resources and attractive landscapes for leisure activities. The ancient City Wall is one of the most famous attractions in Xi’an. Built in the Ming Dynasty (AD 1368-1644), the total circumference of the city wall is approximately 13.8 km. The completely preserved city wall and its wide moat form a unique landscape. Furthermore, recent completion of rehabilitation works on the South Gate of the city wall creates a unique scenery of a magnificent castle surrounded by clean water flows and a green belt. By river dredging, storm water regulation, point and non-point pollution control, sewage collection and treatment, water diversion and interconnection of different waterbodies, all the dirty drainage ditches have been transformed into clean urban streams. Poetic water landscapes are thus, provided to the whole city through a large-scale network of streams, city moats, lakes, and ponds. These are gifts from the “Eight Rivers Regeneration” project to residents. Restoration of the aquatic ecology is also an important element of the project. About 11 kilometers east to the city, a National Wetland Park has been built to provide a suburban leisure site by in-situ restoration of abandoned pits in the river estuary area. Similar restorations have also been implemented in other suburban areas, together with river channels rehabilitation, flood dikes reinforcement, and lakes or ponds reconstruction. These have gradually made people’s dreams for a green city come true. Xi’an is located in the middle reaches of the Yellow River. The annual rainfall of only about 550 mm is significantly less than evapotranspiration. Therefore, provision of sufficient water to sustain the “Eight Rivers Regeneration” project is a critical bottleneck. The Qinling Mountain Range in the south of Xi’an forms the dividing line between the Yellow River and Yangtze River basins, as well as the city’s back garden to provide major source waters for urban water supply. For efficient water use to meet the project’s requirement, an integrated water management plan was developed following the principle of Water Cycle Management. Water saving, multifunctional and cascading water use, rainwater harvesting, and water reclamation form the four pillars of the integrated water management scheme. Managing all stages of the water cycle provided a means to improve the health of water bodies and associated ecosystems, which underpins the city’s livability. 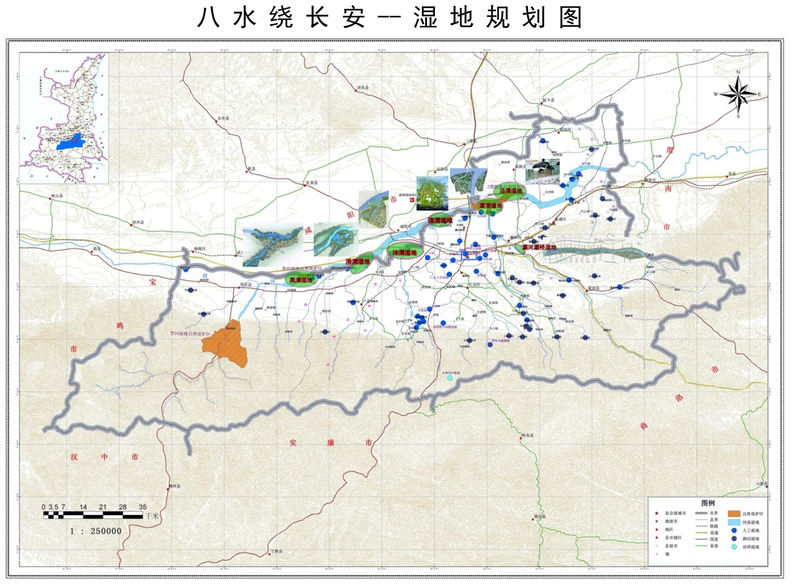 For source enlargement, a number of ecological reservoirs have been constructed to maximize surface flow storage. Also, many rubber dams were built on rivers to provide temporary flood storage areas. These measures increase the urban water supply capacity by 178 million m3 per year. Moreover, through its multi-stakeholder initiatives, the adoption rate of water-saving technologies has grown exponentially to over 70% to reduce agricultural and domestic water demands considerably. Furthermore, with the expansion and upgrading of urban wastewater treatment facilities, the quality of reclaimed water well meets the standard for supplying water to replenish lakes and ponds within the “Eight Rivers Regeneration” project scheme. 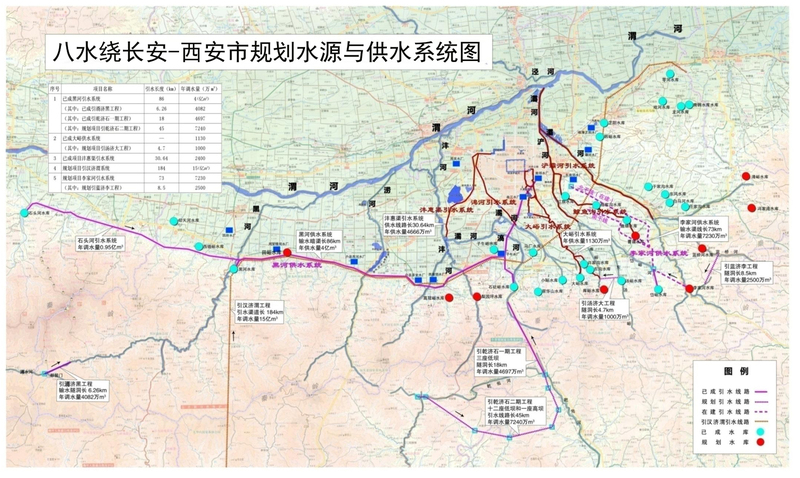 Integrated water management in Xi’an is also combined with water pollution control. The Hancheng Lake has been rehabilitated from a section of the ancient moat, which, for many years was a dirty drainage ditch that received urban sewage discharges, and was filled with garbage and withered weeds, breeding mosquitos and flies, and emitting offensive odors. By open and culvert channels, fresh surface water and reclaimed water are fed to Hancheng Lake. As a result of sediment dredging, lake rehabilitation, and water replenishment, the former dirty water has been transformed into a beautiful water landscape in the central urban area. The current status of the “Eight Rivers Regeneration” project indicate the following: all river channels have been rehabilitated; restoration of lakes, ponds and wetlands has been completed; the water surface area has increased by 448 hectares; the wetland area has been enlarged by 900 hectares; an urban “river-channel-lake-wetland network” has been formulated in Xi’an. These achievements altogether show a newly rehabilitated ancient city with 8 rivers as its lifelines and 28 lakes and ponds as aquatic nodes, all surrounding the central city and radiating to the suburban areas to display the charm of a water ecological landscape along with cultural and historical monuments. The “Eight Rivers Regeneration” project has progressed ahead of schedule and already achieved its set goals. 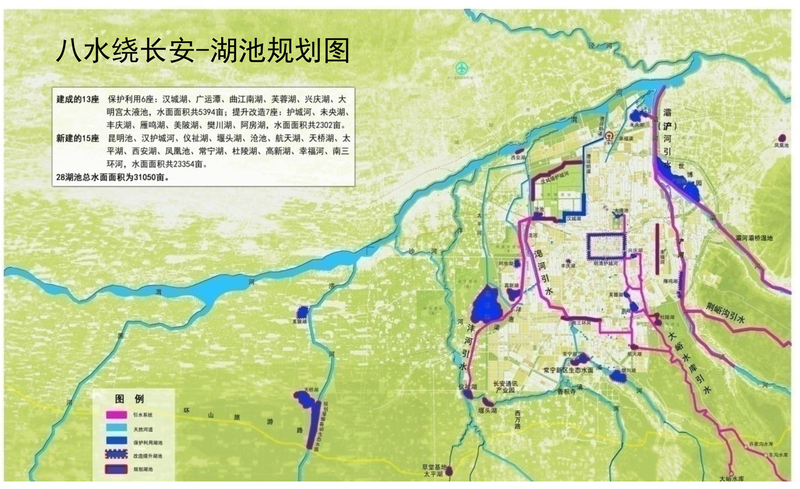 The water area in Xi’an has reached 50 km2, which is equivalent to about one-tenth of the current urban area. Therefore, Xi’an is not only featured by its rich historical and cultural remains, but also its new appearance of a “Water City” with various water elements, a livable city with beautiful water environment, and a more active city with great potential for sustainable development. From the beginning of civilization, human beings have located their homes adjacent to rivers, which have played an important role in sustaining communities of people and other forms of life. Today, the need for water to improve the quality of life and the environment, especially in highly urbanized areas cannot be over emphasized. The success of the “Eight Rivers Regeneration” project demonstrates the intimate connection between the stability of the people of a water-deficient megacity of China, their socio-economic development, and the availability and reliability of water. This realization is achieved through the principle of Water Cycle Management.